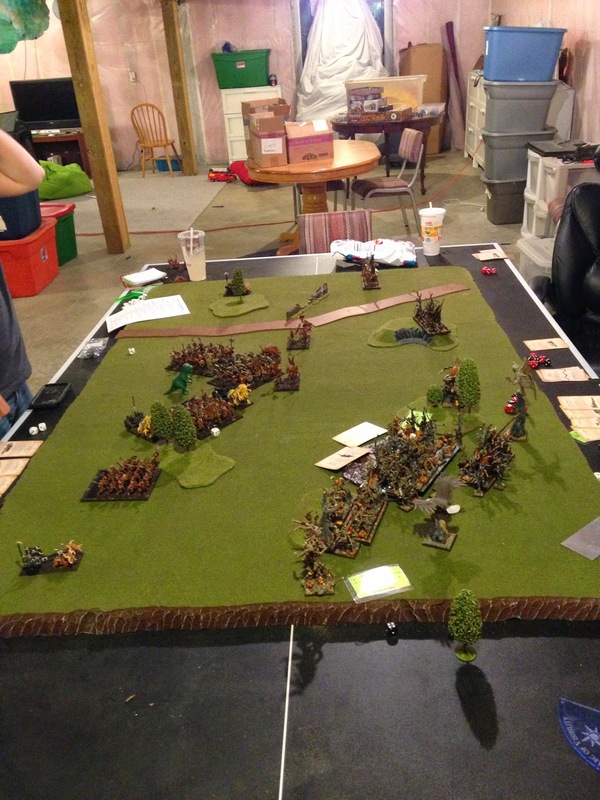 Got in a game vs. McClure Saturday night with Woodies. I went shadow because I've always wanted it with my woodelves. 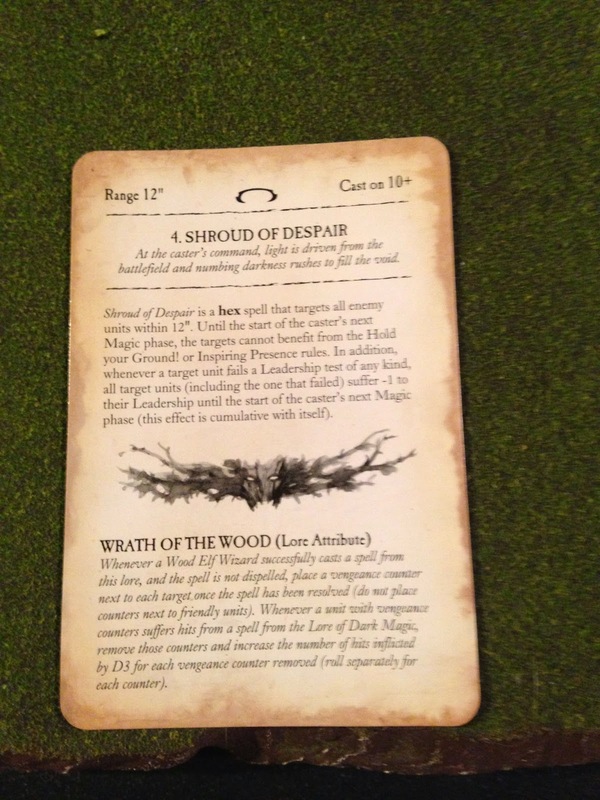 I was also very much hoping for Mindrazor for my dryads (I did get it). I parked heavily in a corner and deployed my WR far away to chase up and go get him. This was start of Turn 2. So, let's talk about what I learned. Trueflight arrows are awesome. I parked my GG bunker with BSB / Lvl 4 behind my Horde of Dryads. Shooting through them each turn without modifiers was awesome. I wasn't dropping tons of wounds but that was only due to the T of my targets. Still good at removing wounds / ranks. Hagbane arrows were also awesome. First turn of shooting pulled a razorgor off the table much to the surprise of my opponent!! Loved it! Wild Riders were the real surprise for me. I was thinking they would be strong with the stat buffs (Frenzy (mounts too), AP, ASF, High Init, and a buff to the Stag also). I shifted mine in front of a unit of Glade Guard to protect them from 2 harpy units + a razorgor. All 3 units charged in, he Wyssaned some harpies, but I was able to kill enough harpies off before he got to strike. The razorgor took 3 WR with him. I pursued and later put the 2 WR + Hero on the flank of a big Gor unit with 3 mages. 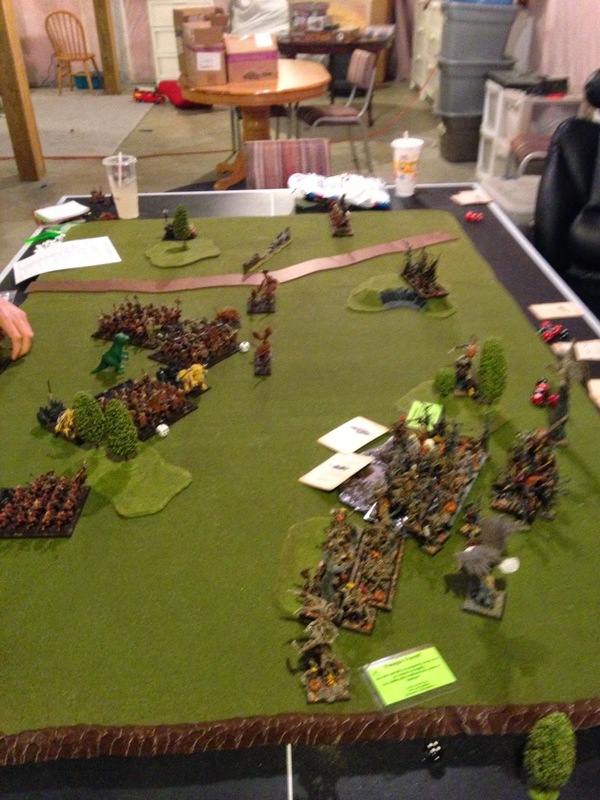 I flank charged that unit and eventually whittled it down over the last 3 game turns. The last round he had like 8 gor + 3 mages left. He miasmed my WR unit (-1), withered (-3) and weakened (-1) the unit. I still killed 7 Gor, broke the unit and ran it down. The game had been a close tie until that moment. Loving the Wild riders. I did only cast this spell and Power of Darkness though (tho I had Doombolt / Soulstealer also). My intent was to have my uni mage in my Treekin but instead stuck her in the horde of dryads so they were Str4. 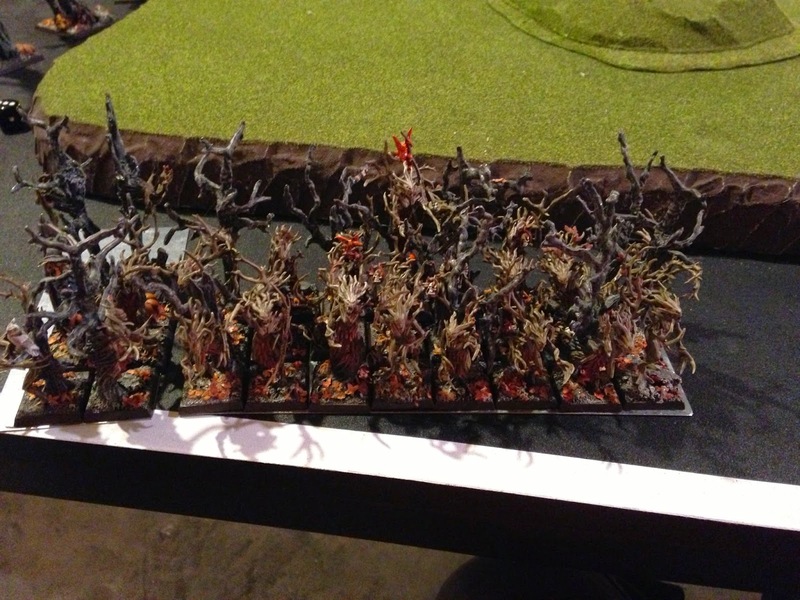 Tom killed about half the unit of dryads eventually but they were steadfast forever!! 8 Treekin struggled vs. Gor unit with BSB. Then he got Wildform off and they struggled even more and were run down. Needs magic buffs to make it. Treemen were surprisingly good. LD9 stubborn gives them utility they never had. Still hard to kill but weaker offensively at S5. Obviously weaker to cannons now then before but still useful. Branchwraiths were very effective. I got dwellers on one and regen (after rolling Throne of Vines lol) on the other. Regen spell could be very useful and I did make 1 failed attempt at a dwellers cast. After that I used them as 75 point speedbumps!! Eagles are always good, no change there. Making a list was tough. Never been spoiled for choice like this. Just using different lores alone was super fun! It was also great using models that had not seen the table since 7th edition. Unicorn mage - Stag Rider as an actual Great stag !!! Branchwraiths !!! Really looking forward to living with this book for a while. Overall very happy with what we were given. Kudos GW. Model wise I love the new EG. Not sold on the ranger build but need to see em first. Love the new Wild Riders but the sisters are a bit too handsome for my tastes. I'm a very, very excited boy!! Thanks for the update Domus! I think you pointed out the biggest buff to the army book and that is there are a lot of good choices now. Just being able to take more than Life and Beasts is going to really change the way the army plays. Domus, man, true flight arrows are the amazing! It's like having Tomb King shooting that actually hits. I'm looking at running them behind more combat based units as well to really take advantage of that always hitting on 3s just because I can.